The Federalists ran a mixed ticket consisting of 2 Federalists (Aaron Ogden and John Beatty) and 4 Democratic-Republicans (William Helms, Ebenezer Elmer, George Maxwell, and Adam Boyd), one of whom (William Helms) was also on the Democratic-Republican ticket. The Federalists capitalized on resentment over the replacement on the official Democratic-Republican ticket of Ebenezer Elmer, from South Jersey, with Thomas Newbold from Monmouth County and the retention of James Sloan. This ticket was formed too late to gain sufficient support, but the Federalists did do much better in state elections that year than they had in previous elections. Ebenezer Elmer Democratic-Republican 1800 Incumbent lost re-election. Henry Southard Democratic-Republican 1800 Incumbent re-elected. Ezra Darby Democratic-Republican 1804 Incumbent re-elected. John Lambert Democratic-Republican 1804 Incumbent re-elected. James Sloan Democratic-Republican 1803 Incumbent re-elected. 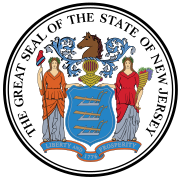 ^ "New Jersey 1806 U.S. House of Representatives". Tufts Digital Collations and Archives. A New Nation Votes: American Election Returns 1787–1825. Tufts University. Retrieved September 24, 2018.